We had to wait a couple of weeks for our first Poky Pedaling Potluck Picnic of 2015, but the wait was certainly worth it. Unlike the unseasonably cold weather for the originally scheduled PPPP two weeks ago, yesterday was a pleasantly warm day under blindingly sunny skies. One couldn’t ask for a nicer day for our rescheduled PPPP. 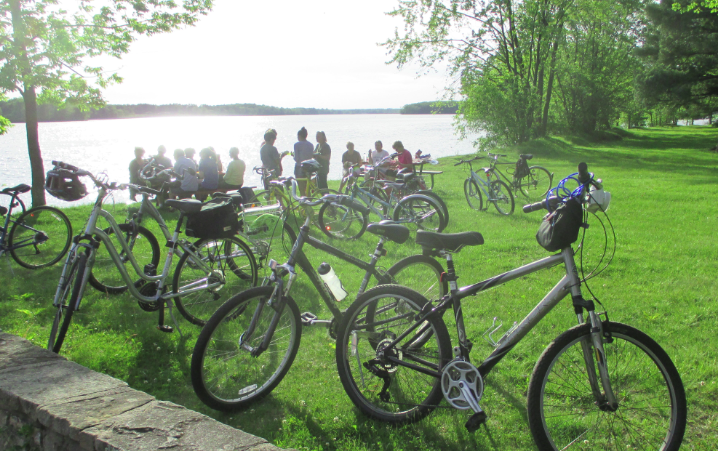 Seventeen Poky Pedalers gathered at Goerke Park to set off on PPSP’s monthly picnic-inspired Bike Fun. And for this PPPP, there was additional anticipation due to a special post-picnic mystery Bike Fun destination announced for the evening. From Goerke Park, we took a northward route towards NorthPoint Drive, on which we headed west. Upon reaching Forest St, we headed south and eventually made our way into Bukolt Park. Our picnic destination, just under 4 miles from the start, was a grass area along the Wisconsin River immediately north of the old boathouse. Upon arriving, we spread our potluck contributions onto a picnic table, filled up our plates, and made ourselves comfortable as we enjoyed a hearty feast while soaking up beautiful riverside views under extraordinarily clear skies filled with gorgeous sunshine. What a perfect way to enjoy the company of Poky Pedalers. 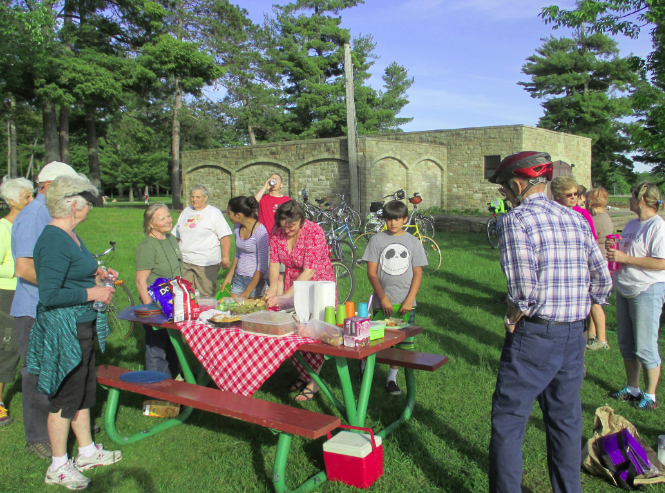 Our delicious picnic finally came to an end, but there was still more Bike Fun to share. After packing our picnic paraphernalia up, we rode south on the path through Bukolt and Pfiffner Parks and arrived at the Riverfront Art Center, where the CycleLove exhibit is on display. 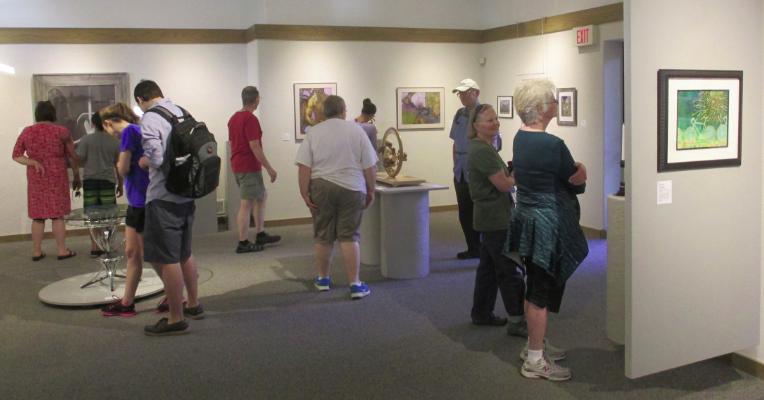 Nancy Thorson, Director of the RAC, was kind enough to provide us a private showing of the magnificent bicycle-themed art on display. Our group of Poky Pedalers eagerly roamed the exhibit admiring the dozens of artistic interpretations of bicycling in a variety of media. This special post-picnic mystery Bike Fun destination certainly did not disappoint. As perfect as our picnic experience had been, this opportunity to appreciate the artistic talent comprising the CycleLove exhibit made the evening even more perfect. Once our evening of food and art was complete, we hopped back on our bikes and returned to Goerke Park, completing a 7-mile loop. Our PPPP was a quintessential Bike Fun experience. I want to thank Nancy Thorson for graciously opening the RAC for us to view the CycleLove exhibit. CycleLove closes on June 7, so Poky Pedalers had better hurry back if they want another peek at this collection of bicycle-themed art. Additional information, including hours of operation, can be found here. More Bike Fun is coming up fast as well. The 2015 Bike Fun Calendar and the Upcoming Poky Pedals webpage have all the info. Take a peek and make your plans, because you don’t want to miss a single opportunity to share Bike Fun with PPSP.